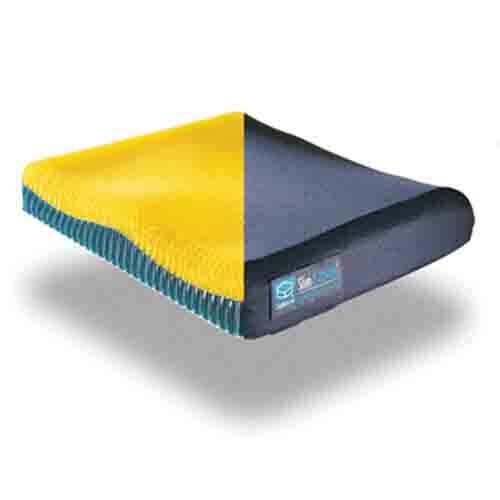 Stimulite Slimline Sling Seat Cushion, produced by Supracor, is an exceptional seat cushion for dynamic and energetic individuals whom are at a lower risk for decubitus ulcers, more frequently known as pressure sores or bed sores. In fact, the Stimulite Slimline Sling Seat Cushion is excellent at hindering the development of decubitus ulcers, too, as this Supracor seat cushion emphasizes a low profile, ventilated 2.75-inch thick, dual-layered cushion, and measures in at a sheer 3 pounds. Additionally, the Stimulite Slimline Sling Seat Cushion, dissimilar from other seat cushions, integrates adductors, an abductor, and a backside dish that forms an intricate contour for optimal comfort, support, and stability. To secure greater support and stability, the base of the foundation features a convex shape to securely clinch its place on a seat. As with the entire line of Supracor cushions, the Stimulite Slimline Sling Seat Cushion is machine washable. To successfully assuage discomfort and prevent decubitus ulcers, bed sores and pressure sores, order this long-lasting, yet comfortable and supportive seat cushion today! Conforms to unique body contours. Convex shape on the bottom to increase stability. Perfect cushion for active people. Provides optimal support and comfort. Product Numbers: SM1416S, SM1616S, SM1618S, SM1816S, SM1818S, SM1820S, SM2016S, SM2018S, SM2020S. Sizes (all measurements are in inches): 14 x 16, 16 x 16, 16 x 18, 18 x 16,18 x 18, 18 x 20, 20 x 16, 20 x 18, 20 x 20. Application: To assuage pain and discomfort from pressure sores, decubitus ulcers, and bed sores.